So what’s so great about the Great Pyramid? 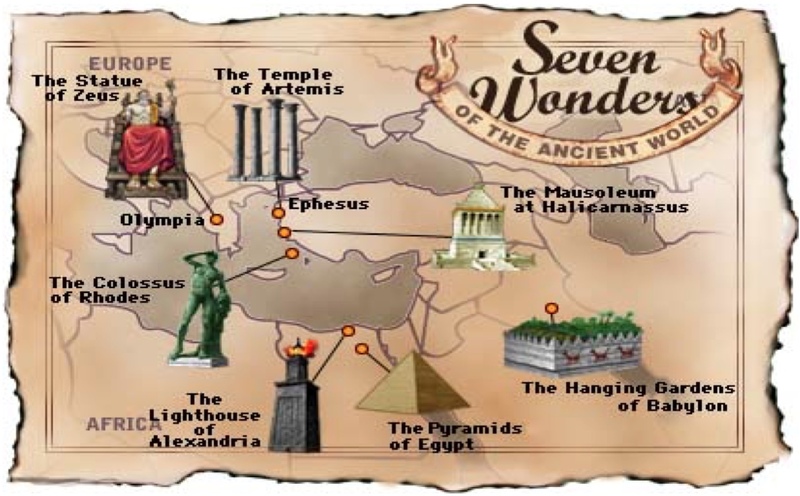 Let’s look at a variety of ways that the Great Pyramid of Giza sets itself apart as one of the greatest marvels of all time. Gone is the Statue of Zeus, the Colossus of Rhodes, the Lighthouse of Alexandria, the Hanging Gardens of Babylon, the Temple of Artemis, the Mausoleum of Halicarnassus. Only the Great Pyramid is still with us. It is one of the oldest structures on the face of the earth and arguably the best built. Its mortar joints are consistently 1/50 of an inch, thinner than a sheet of paper! Sir William Flinders Petrie declared that this craftsmanship could be compared to the “finest opticians’ work on a scale of acres.” Consider that there are hundreds of thousands of stones that make up the Pyramid, none weighing less than a ton, most weighing about two and a half, and some as much as 20 tons! The Pyramid covers over 13 acres of ground and is almost entirely solid masonry, not hollow or earth-filled like the Central American pyramids. Building it today would stress even the best construction cranes and the best and largest private construction companies, their most talented artisans and their best engineers… and it would be too expensive to build! The Great Pyramid is uniquely situated on our planet. 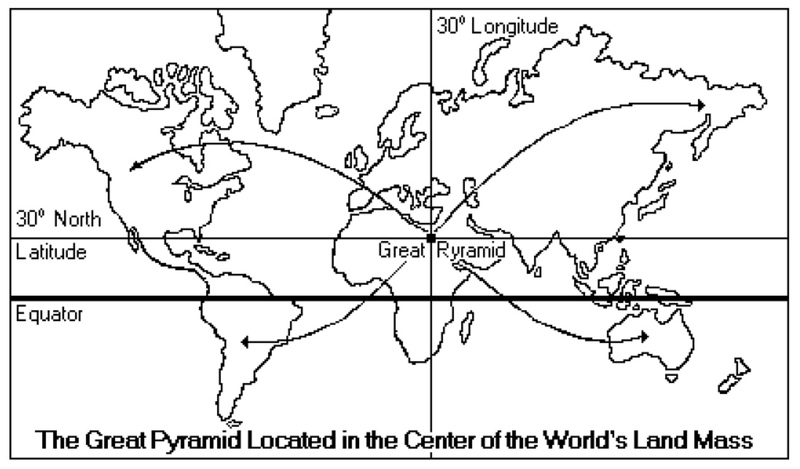 Joseph Seiss claims that the Pyramid lies in the center of gravity of the continents. Many others say that it also lies in the exact center of all the land area of the world, dividing the earth’s land mass into approximately equal quarters. The north-south axis (31 degrees east of Greenwich) is the longest land meridian, and the east-west axis (30 degrees north) is the longest land parallel on the globe. There are only two places that these longest land-lines of the terrestrial earth can cross. One is in the Pacific Ocean, and the other just happens to be at the Great Pyramid! This fact alone is – incredible! 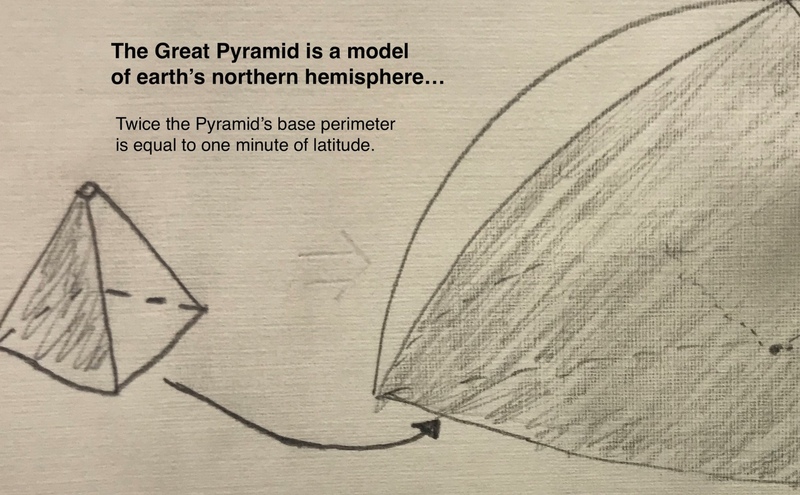 For the Pyramid to be a replica of the northern hemisphere, there must be a relationship between the measurements of the Pyramid and those of the earth. The Egyptian government sent J.H. Cole to measure the base of the Pyramid in 1925 and he found that twice the perimeter of the Great Pyramid’s base was 1,842.91 meters. The modern figure for a minute of latitude at the equator is 1,842.9 meters. Thus, each base side of the Pyramid is equal to 1/8 minute of a degree, and thus twice the perimeter would be equal to almost exactly one minute of latitude on planet earth! In a recent article Keith Hunter also makes a case that baseline of the Pyramid was determined by the builders from the relationship of the elliptical arc between the Pyramid itself in Giza, and the equator. Again, the Egyptians would have to have known that distance to design the mighty structure. Hunter says the designers took 1/14400 of the distance of that arc, based on the 144,000 polished limestone blocks which originally covered the entire pyramid, making the Pyramid appear as a shining diamond with the bright sun reflecting off of it. Many of those beautifully polished casing stones were knocked loose in a 14th century earthquake, and then the rest were removed by enterprising builders who used them to build many of the mosques in Egypt! The Great Pyramid is now “naked” having lost all the glittering stones that once covered it, and the second great pyramid in Giza shows just a few weathered ones remaining at its top. Despite being one of the oldest structures on the face of the earth, the Great Pyramid has been called one of the most accurately oriented, its four sides facing almost exactly due north, south, east, and west. The Paris Observatory, symbol of Enlightened man’s advancement by science instead of superstition and religion, is six minutes of a degree off true north. The Great Pyramid is only three minutes deviant, and E. Raymond Capt claims that is due mainly to subsidence. There are architects and engineers who have studied the Pyramid’s structure and contend that, with all our vaunted technological prowess, we could not build the structure today. Does the theory of evolution run in reverse? We will leave for later posts the geometrical evidence in the Pyramid that it is not a dead tombstone, but a living Prophet, in the unique way it combines length and time. We thought that only modern Einsteinian physics combined space and time, but long before Newton the Silent Sage was blending them! ← Be true to your school!